Hmmmm… must be short ribs. Now I’ve eaten short ribs, but never cooked them before. I quizzed the fine folks at the Egghead Forum and Fearlesskitchen pointed me to his version of Adam Perry Lang’s short ribs. They looked so promising that I decided to use it as a starting point for my own version. Combine the mustard, Worcestershire, and vinegar. Moisten all sides of the ribs with the mustard mixture, then dust the ribs heavily with the rub. You can do this right before the cook, but I like to do it the night before to let the rub melt into the ribs. Set your smoker up for at least a 6 hour indirect cook at 300°F. On the Big Green Egg this means filling the firebox with lump charcoal and using an inverted plate setter to diffuse the heat and a drip pan with a little water in it to catch the fat. You are going to smoke the ribs first to give them that wonderful flavor and render out a lot of the fat, and then braise them in aluminum foil to make them tender. Once the smoker is up to temp, toss in your smoking wood (I used pecan), and arrange the ribs bone side down on the grate. Close the lid and let the smoker do its magic for 4 to 5 hours, or until the ribs reach 160°F internal. This is for the braise. While the ribs are cooking, prepare the wrapping mixture. Start by pouring the beef broth into a small saucepan and bringing it to a boil. Let boil for about 10 minutes, or until the broth has reduced to about 1/2 cup. Reduce the heat to low and add the sugar, honey, Worcestershire, vinegar, and butter. Stir and cook just until the sugar has dissolved. Remove from heat. When the ribs are ready, lay down a sheet of heavy duty aluminum foil in a 9×13 baking pan. Add the ribs, meat side down, pour the wrapping mixture over them. Put another sheet of aluminum foil on top of the ribs and crimp to seal the two sheets together. Put the pan full of ribs back on the smoker for an hour, or until the ribs reach 190°f internal. Remove the meat from the smoker, and allow to rest in foil for 15-30 minutes. Serve drizzled with pan juices or your favorite barbecue sauce. 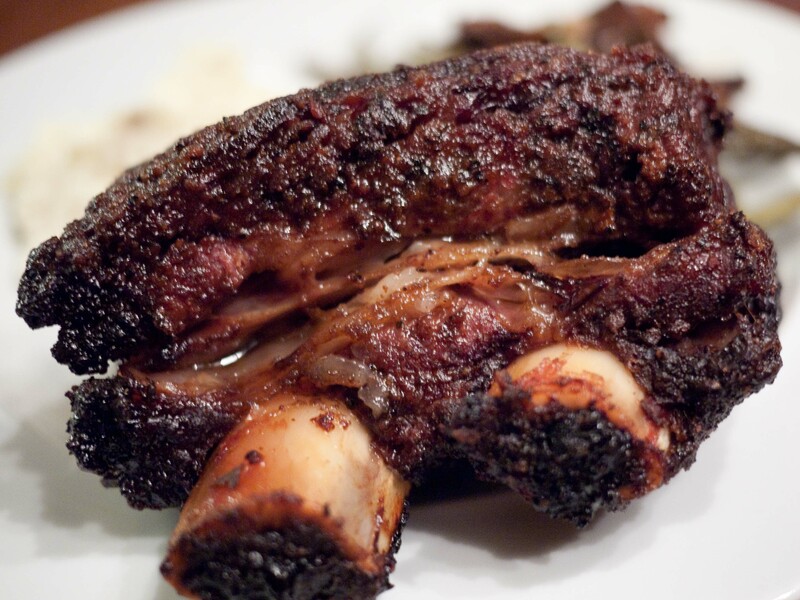 These were some very tasty ribs – rich and peppery with plenty of smoke. The Black Bart’s added a bit of background heat from the cayenne and a good bit of back pepper spiciness up front. This is a great beef rub. The 3 stars are my fault. I ran short of time and didn’t leave the ribs on the smoker long enough and didn’t return them to the smoker after the braise like Lang suggests. As a result – I didn’t render out as much fat as I should have and didn’t cook the ribs long enough to make them really tender. They were good, but if I had done them right they should have just melted on the plate. Better luck next time. Our butcher now knows when we get our plate ribs, we want them untrimmed. Yours look good at least but yeah, they pretty much require some braising. I’ve learned that the hard way too. What a nice photo of those ribs. For some reason beef and my camera just can’t seem to get along. I’ve only made short ribs once. Braised. Loved them. Appreciate the recipe for that mustard rub. Sounds really good. Thanks! Your photos always look great to me, but try a little fill flash – it keeps the meat from going too dark. Also try and get your white balance pretty dead on to keep the color accurate (that’s one of the reasons I shoot a lot on white plates). Short Ribs are one of my favorites. They do take a long time.